Onco-fertility is simply any fertility service provided to a recently diagnosed cancer patient who wants to explore options for having future children. As cancer treatments become more effective, more cancer patients become cancer survivors. Many patients may not have started or completed their families and are concerned that the cancer therapy may render them unable to have children once their cancer is controlled or cured. Many think that they must choose between treating their cancer and preserving their fertility. In the past, this was often the case. With early, timely referrals to a reproductive specialist and more reproductive options, many patients can now do both. Any patient referred by a cancer center or oncologist is eligible for care. Some discounted services are income based while others have no income requirements. Applications for discounted services will be provided and a consultation with the PREG financial counselor will be arranged. A full range of fertility services are covered and will be offered to each client with specific services offered depending on client history and wishes. The oncology office or a Gibbs Cancer Center counselor will meet with the patient and briefly assess whether the patient is interested in a referral to Piedmont Reproductive. This representative will contact PREG's onco fertility nurse liaison who will then call the patient. She will answer all questions and coordinate appointments. Those so desiring, will be given an appointment within 2 business days. Once the patient has met with a PREG physician or other team member, a potential plan will be developed. Our physician will then consult with the oncologist to coordinate care so as to minimize any delay in cancer treatment as well as verify any specific hormone receptor issues specific to the cancer. Male patients who simply desire sperm freezing may have the sample frozen and some blood labs drawn that are required for sperm cryopreservation at the time of the first visit to PREG. The onco fertility nurse liaison will coordinate care and provide timely updates to the oncology office. Piedmont Reproductive Endocrinology Group (PREG) is proud to be partnered with the Gibbs Cancer Center, a division of Spartanburg Regional Healthcare System to offer reduced cost fertility preservation options to citizens of Upstate South Carolina and Western North Carolina. 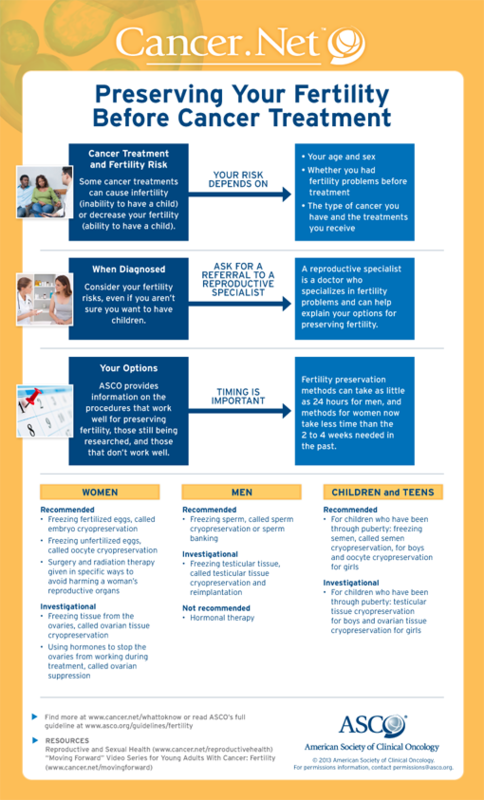 Patients of reproductive age now have a seamless referral process that allows them to explore and possibly pursue options for preserving the ability to have children after completing cancer therapy. The reduced cost and expedited services are made available to clients by the physicians of PREG and collaborative programs provided by the Lance Armstrong LiveStrong Foundation, ReproTech Corporation, Serono and Ferring pharmaceutical companies. Will This Cause a Delay in the Cancer Treatment and Could This Be Dangerous? Depending on the option chosen, there may be no delay, a very minimal delay or possibly up to 6 week delay for women opting to undergo in vitro fertilization. Many times the cancer treatment and fertility treatments may be coordinated so as to have little or no delay. Recent studies seem to indicate that time delays or short term hormonal elevations for fertility preservation have little impact on most cancer outcomes. The exception may be some hormone dependent tumors. No one can say with 100% certainty that the delay in cancer treatment or the fertility treatment itself would have any impact on cancer outcome. Can You Give Some Examples of Exactly What You Mean? Men about to undergo surgery or radiation for cancer can collect several samples through masturbation (one or even two a day) for freezing. One or two cryopreserved samples may provide enough sperm for future in vitro fertilization (IVF) cycle(s). Men who are able to collect and freeze four or more samples may, depending upon quality, have enough banked for later use for artificial insemination of their partners. A woman with breast cancer many times has a surgical procedure before starting chemo or radiation. The healing time between surgery and follow on treatments is generally 4 - 6weeks. This is a perfect time interval to do in vitro fertilization. Thus, the fertility treatment does not delay cancer treatment. Many other cancers that require surgery will also fit within this time frame. Ovarian or testicular tissue harvesting and freezing may be done at the time of cancer surgery- thus saving expense and time. Contact Piedmont Reproductive Endocrinology Group at 864-232-7734 and ask to speak to the onco fertility nurse or ask your oncologist about a referral to PREG.